“Living the Call of God” received in 2015 an “EPIC EBOOK AWARD Nomination. With this Volume 3 of her popular Jesus Series, Barbara Garro suggests a new approach to giving glory to God through service to God, Others & Self. You love God so much, you long to do things that please Him. When you understand you can use your talents to serve your preferred, comfortable way, when and where you like, you feel more confident serving. Garro says, “God is happy to show you the way to service every day when you ask Him for guidance in your daily prayer time.” Read stories of school children through octogenarians sharing the unique ways they have discovered to use God’s gifts to serve others. These stories offer proof that believers of all ages can serve following Jesus’s life examples and teachings with Garro commentary and questions for your own pondering. “Once again, Barbara Garro takes us on a journey through the Parables of Jesus and she does so in her own unique style. As in her previous two volumes. Ms. Garro once again gives us a personal and challenging perspective on these special teachings of Jesus. 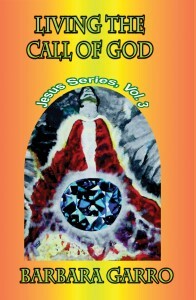 In this third volume, we are brought to reflect on God’s call to service. As always, in her simple, down to earth style, Ms. Garro challenges us to reflect on the challenge of service to God, Others, and to Ourselves. Through commentary and poetry this book gently leads us to look at our spiritual journey in a different way. In this work, Ms. Garro shows how to apply in our daily lives the amazing lessons found in each parable.” Very Rev. Joseph C. Tizio, C.Ss.R.